Make the most of outdoor living in the spaces in between. 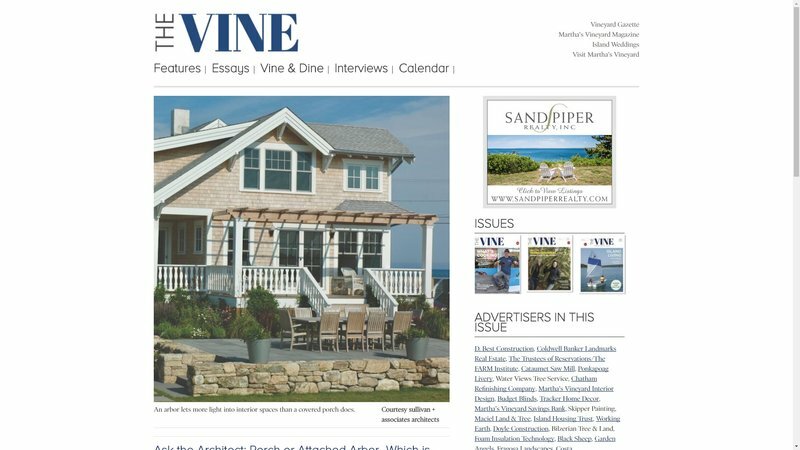 Look for my new "House Talk" column about outdoor rooms in The Vine, a publication from the Vineyard Gazette Media Group, on newsstands now. Q: I’m attempting to design and build a small, simple, rectangular two-story house with a gable roof, likely with a roof pitch of either 6/12 or 8/12 and an overhang, on a very tight budget. I love old houses -- especially the old farmhouses; they’re beautiful in their simple but classic designs. I’m trying to figure out a way to build my little house but not have it look like most of the ugly subdivision houses that are being built today. I would like to have the option to "dress it up" in future years. Is there a roof rake/eave design that you might suggest that would be relatively inexpensive and somewhat simple to build but maybe could allow more detail to be added in later years that would help make a boring ugly little house into something more beautiful? And would this be dependent on whether or not you used a rafter or a truss roof construction? The builders seem to all want to go with the raised heel truss (energy truss) construction, and I’m trying to educate myself on how this affects the look of the eaves etc., if at all, as opposed to a more traditional rafter roof construction. A: You’re correct in concluding that the roof and the resolution of its eave and rake details are critical to your home’s appearance. (The eave, for readers who are not familiar with the term, is the roof’s horizontal edge along the exterior wall. The rake is the sloped edge that travels up the exterior end wall of a gable or shed roof.) An overhanging roof, which I gather is your preference, can help protect the walls of your home from roof runoff, provide some shade from harsh mid-day sun in the summer, and lend your home a sheltering look with a pronounced shadow line at the roof-wall intersection. I’ve actually written a couple of design articles for other publications about eave and rake design. In this article I wrote for The Journal of Light Construction, I define two general types of eaves and rakes: clipped and extended. Those can, in turn, be open or closed. I mention in the article that “often the design of the eaves drives the rake design.” I focused specifically on rake design in this article for Fine Homebuilding magazine. It’s the resolution of the intersection of the eave and the rake that is the primary challenge with eave and rake design. An all-too-common builder default is to pair an overhanging eave that includes a flat soffit with a clipped rake, and then to resolve the eave transition to the sloped rake with an awkward triangular piece of rake trim. Instead, in your case, where a simple to construct, classic, yet budget-conscious solution is desired, I would suggest a closed, modestly extended overhanging eave with a sloped soffit that follows the rafter/roof slope, and a closed, slightly shallower extended overhanging rake. This allows for a clean transition from the eave to the rake. The eave and rake overhanging dimensions would be a function of the soffit board widths. The eave soffit might be comprised of three 1x4 boards running perpendicular to the rafters, and the rake soffit boards might be comprised of two 1x4 boards running parallel to the rafters, attached to short look-outs. Depending on your insulation approach, you might want to incorporate eave venting in the eave dimension. (I would not recommend trying to “dress up” the eaves and rakes later, since the roofing and its edging/flashing along roofing trim should happen contemporaneously.) I would assume a 1x6 fascia on the eave and rake with a wrapping 1x3 shadow board. You would also want to include continuous wrapping frieze trim. Whether your builder is stick-building your roof with conventional rafters or using raised-heel trusses, he or she should be able to incorporate the eave and rake treatment I’ve described above as framing sistered or applied to the roof framing. As with all construction, the desired design feature would need to be identified prior to construction in order to incorporate it into the builder’s planning/budget. Email architect Katie Hutchison (Katie@katiehutchison.com) your general-interest residential design question. Put "Ask Katie" in the subject line and summarize your question in a couple of paragraphs. Include your name, town, and state. Check back with the Ask Katie category to look for Katie's responses to select questions. photo courtesy of the homeownerQ: We recently purchased a home that is a 60’s style single-story front gable structure with a low pitched roofline. The interior has been completely remodeled, but I really feel like something needs to be done to the front of the home (entrance) to make it complete. I do realize the roofline will be the most limiting factor, and we may just have to work around it. We really like the Cape Cod/refined look, but don’t know where to start with the ideas to help its curb appeal. Obviously, in the most cost effective way (paint trim, add entrance way, exterior coverings), I was curious to see if you could help us out with a few ideas to bring out the potential in the home. A: This rancher front elevation has great unrealized potential. It could really shine if we highlight and capitalize on its inherent ranchiness. That is not to say, however, that a subtle layer of non-ranch influence could not inform its unique countenance. But it would need to be a sympathetic influence, a compatible influence, not something too alien. The simple, low-slung, gable roof of this home is probably its most identifying and strongest feature. The next most impactful feature may be the ganged horizontal windows, in what is presumably the living room, to the left of the entrance. The third strongest design element may be the horizontal sills, lintels and entrance canopy. The least successful portion of the front elevation may be the right side of the entrance where three disconcertingly vertical double-hung windows populate the horizontal swath defined by the brick window sill and wood lintel which becomes the entry canopy. Also, it's this side where the base of the home becomes uncomfortably muddled or non-existent. The planter off the far left of the home, in combination with the higher grade there, seem to better ground that side. The introduction of a more substantial entry porch which extends out from the existing doorway and to the right could help remedy much of what ails the front of this house, while reinforcing the horizontality of the sills, lintels, and canopy, as well as balancing the horizontal bank of living room windows to the left. I suggest removing the existing entry stoop and replacing it with a grey, rectilinear, stone stoop/terrace that extends to the left a couple of feet and all of the way across the right front and six to eight feet or so forward of that portion of the house. (Of course, this assumes that the local zoning would allow such a stoop/terrace footprint.) The top of the new stone stoop/terrace could run a few inches beneath what appears to be vents along the front. The lower height of the new stoop/terrace would likely mean including a separate landing (of the same material) that's a step or so up in front of the entry door. The new stoop/terrace could end in steps to grade on the far right facing the side yard. The new stoop/terrace would reinforce the home's horizontal design and introduce a base to better ground the home. A new, deeper, horizontal, wooden canopy in the location of the existing canopy that's supported beneath by thin metal stays/brackets could extend to the left of the door over the new stoop/terrace and to the right across the swath of windows and stop where the existing canopy/lintel stops, while projecting about three and one-half to four feet in front of the right portion of the house. This would provide porch shelter and further reinforce the home's horizontality and the horizontality of the swath that contains the double-hung windows. The introduction of some natural-finish, warm-stained cedar (or fir) might lend the exterior more warmth to play off the painted white brick. In fact, I'd recommend painting the brick another color, something in the light green lichen color family might be pleasant. The existing vertical composite siding above the windows could be replaced with natural-finish, warm-stained vertical cedar v-groove tongue and groove boards. The existing vertical composite siding in between the double-hung windows (both on the right and left sides of the front) could be replaced with natural-finish, warm-stained horizontal clapboards -- again, to reinforce the horizontality of those areas. Window (and door) surrounds in all areas could be replaced with the same natural-finish, warm-stained cedar. Of course, this new palette of materials and colors would need to be applied on all sides of the home. A terrace/landing guard rail composed of new natural-finish, warm-stained intermediate posts, horizontal cable rails, and a natural-finish, warm-stained, shaped cedar cap might complement the new look nicely. You might even consider adding fixed, slatted, natural-finish, warm-stained cedar screens -- the height of the lower double-hung sashes and in alignment with them -- running across the front of the horizontal openings (which contain the double-hung windows and infill to the far left and right of the front door). These would act as privacy screens (instead of the interior window shades) in the more private spaces, while reinforcing the horizontal swaths between the painted brick elements. The addition of the new horizontal stoop and guard rails, a deeper bracketed horizontal canopy roof, a new materials and color palette, and new slatted wooden screens would enhance this home's ranchiness, while better grounding it and lending it a dash of Arts & Crafts influence (an influence not as far afield from a ranch as a Cape influence).